(CNN) - In defending his latest television ad, Texas Gov. Rick Perry on Friday continued his attack strategy against President Barack Obama and emphatically called him a "socialist." "Absolutely," Perry said in an interview on Fox News. "I think Barack Obama is a socialist." Conservative talk show host Bill O'Reilly was the latest to question the presidential candidate over the validity of his new TV ad, which claims Obama believes Americans are lazy. The spot, broadcast in Iowa and nationwide on cable, showed a clip of Obama saying, "We've been a little bit lazy, I think, over the last couple of decades." In the ad, Perry said: "Can you believe that? That's what our president thinks is wrong with America? That Americans are lazy? That's pathetic. It's time to clean house in Washington." But critics argue that Perry took Obama's "lazy" remark out of context. The president made the comment in response to a question last weekend about how foreign investors viewed the United States. When listening to the rest of his remarks, Obama seemed to be addressing U.S. business practices as "lazy," rather than American workers or voters. O'Reilly on Friday questioned Perry over whether he was being misleading with the ad. "I believe he was talking about Americans," Perry responded. Perry added that he believes the president "truly misunderstands" the country's free enterprise system, citing a 2008 campaign moment when Obama was confronted about taxes by a voter who later became known as "Joe the Plumber." Obama responded saying that spreading the wealth around was "good for everybody." 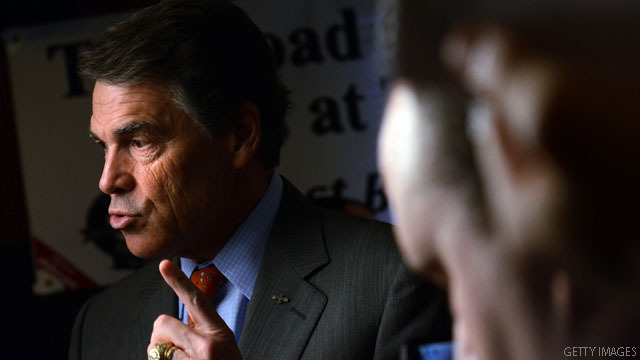 "When you talk about printing money and spending government money, and trying to spend it out," Perry said. "That conversation he had with Joe the Plumber - kind of redistribute the wealth - the best I can tell, that's socialism." According to the latest CNN/ORC International Poll, Perry took 12% of support among Republicans and those leaning toward the GOP, putting him fourth place in the GOP race for the White House. What do you see next in his life? Dancing with the Stars? So is Perry if you want to get technical. Anyone in favor of forced participation in Social Security is a socialist. The problem with politicians throwing the "socialism" word around is that it sticks to them too. Perry included. I don't agree with everything Ron Paul says, but he is the only one free to cast stones. I think Perry is still in a mental freeze. Can any Republican speak without lying? About anything?